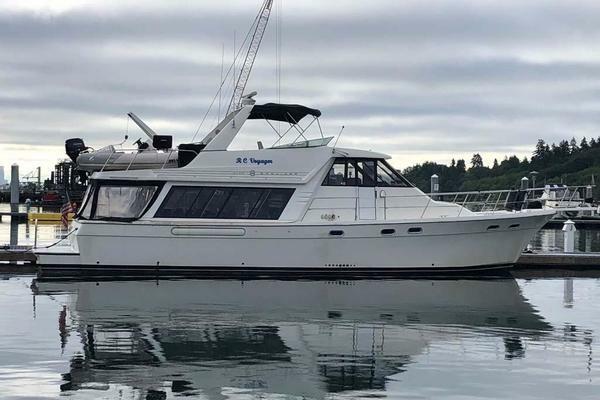 United Yacht Sales New Jersey would love to guide you through a personal showing of this 53' Krogen Express 1999. This yacht for sale is located in Unknown, Newfoundland And Labrador and priced at $495,000. For a showing please contact us by filling out the form on this page and we will get back to you shortly! SHAUNA LEIGH is a two stateroom, two head layout with all acommodations forward of the pilothouse. Sound insulation is excellent and the sole is teak and holly and the interior joinerwork is satin finished teak. The salon is entered from the covered aft deck. The aft bulkhead has three custom opening doors which allow effortless movement and expansive vistas from the salon. To port are storage cabinets and shelves, 2 occasional chairs and wicker table. Forward is cabinetry that houses an icemaker, storage compartments and book shelves. To starboard is a large, aft facing L-shaped settee and folding pedestal mounted table that can easily accommodate 6-8 people. The table also converts to a double berth when necessary. There are large opening windows port and starboard with teak wood mini-blinds, decorative drapes and cherry valances. The U-shaped Galley is located on the starboard side - forward of the salon. The spacious master stateroom is forward with a queen sized island berth, ensuite head with stall shower, 2 hanging lockers, abundant drawer and locker storage, 4 opening port holes and a large overhead screened hatch. The pilothouse is up and forward of the galley. It has side doors (custom built by Pacific Coast Marine in place of slider doors. Installed in 2011. Similar to Freemen 1720) port and starboard, a convertible settee with table and screened overhead hatch. The pilothouse is spacious and offers excellent visibility. The NAV aids and instrumentation are well located for quick and accurate reference. 600 GPD watermaker by Watermakers Inc.
Hand laid Nitex fiberglass construction with closed cell PVC sandwich core used in topsides and hull above water line.